After about 28 hours, power was restored to our home yesterday, which is nothing compared to what’s happening in other parts of the world. The entire episode was a necessary education in conservation and a return to a much simpler life if only for a day. We lost water (both hot and cold) and electricity, so no lights or gadgets except what we could power with our tiny generator. 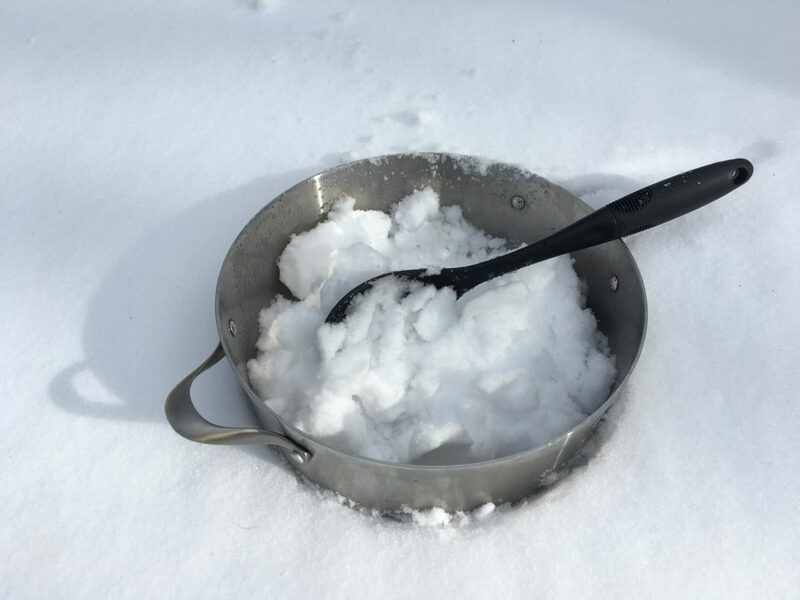 We had a wood stove for heat, but no shower, or toilet or even hand washing and the dishes piled up in the kitchen, which was so annoying that I spent hours melting snow to clean up. It takes approximately three to four cubic feet of snow to fill a 1.6 gallon toilet cistern that gives you one good flush. It takes another cubic foot of snow or so to do the dishes. This takes hours of slow melting of the snow over the stove in several saucepans. You can power a large fridge and a chest freezer (and a couple of electronic items) for 12 hours with one gallon of gas/petrol in a generator. One neighbor reported having emptied their fridge and buried all their food in the snow, which worked like a charm. It’s also a real, palpable relief to let your body wind down with the sun at dusk and spend 12 hours in darkness with a couple of flashlights. We too often spend our entire 24-hour day until we go to sleep with all the lights blazing and gadgets like TVs, laptops and phones flashing and beeping at us continually. To have peace and quiet, in the dark, with a generator humming in the background was calming and meditative. Self-reliance, even for a day, requires a certain level of fitness. Chopping wood, shoveling and trying to snowshoe over three feet of snow around the property to check damage is demanding. Because power was out all over the Catskills – including gas stations, restaurants and other public places – our plowman couldn’t get to us, so I cleared most our 30ft driveway by myself. It was a fun way to get a work out in without thinking about it. Later on in the day, fire stations opened up as warming stations, offering coffee, and a local restaurant Peekamoose, that had a generator, offered free soup and a place to warm up. Our local radio station, WIOX, has a generator and opened their doors to people who needed to charge their gadgets or warm up. Power was unexpectedly lost because the snow was so heavy that it felled trees – in our area a large stand of hemlocks – that crushed power lines. Thanks go to NYSEG for making all the necessary repairs so quickly and thanks to the town plowmen who worked day and night to keep the main roads clear. Tips to prepare for the next winter storm: park the car at the street end of the driveway, so minimal shoveling is required; take a long shower; fill the bathtub and buckets with water; prepare meals in advance. Prepare tea or coffee in advance, so you only have to re-heat it on the wood stove. This entry was posted in First Person Dispatch and tagged Catskills, Catskills Storm, Storm Prep, Upstate NY, Winter storm on March 4, 2018 by JNUrbanski. Sweet! But we elderly and I mean elderly who shovel out themselves with a snow SHOVEL would appreciate it if after the street plowers push a mountain of icy hard snow into the apron of our driveways we would appreciate some help from the town digging out of the apron of our driveway the next day after the storm. Once in my forty years of living here, a town employee in a truck saw me digging out and used the plow on his truck to help me. It too him two minutes and saved me a tremendous labor of backbreaking work.